I feel that both autumn and spring pass quicker with every year going by – we’re almost going from summer straight to winter these days, crazy, huh? There are a bunch of things I do during this time of year to try and avoid being completely knocked out by the flu. Increasing my intake of Vitamin C & adding more things like Apple Cider Vinegar & Turmeric to my foods is only one of them. Apparently when the first signs of a cold approach it’s already too late to up your vitamin C, so I like to be preventative and automatically start with it as the days get colder. My diet around this time of year also switches to more warm and comforting foods, such as soups and stews. It’s simply what feels good, especially after a walk in the cold, fresh air. 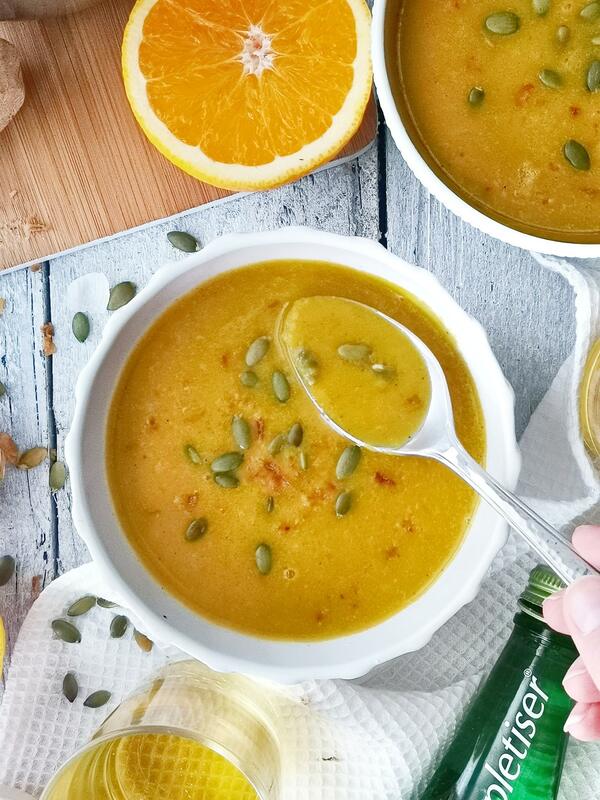 I’ve recently been loving to combine both warming foods with a good serving of Vitamins – like I have done in this deliciously fruity curry soup. The idea for this soup actually goes back to my uncle, who made this soup for Christmas a couple of years ago and I’ve simply adapted his recipe to include more fresh ingredients and make it vegan (he used honey in the original, as well as store bought orange juice, curry paste and powdered ginger & garlic). 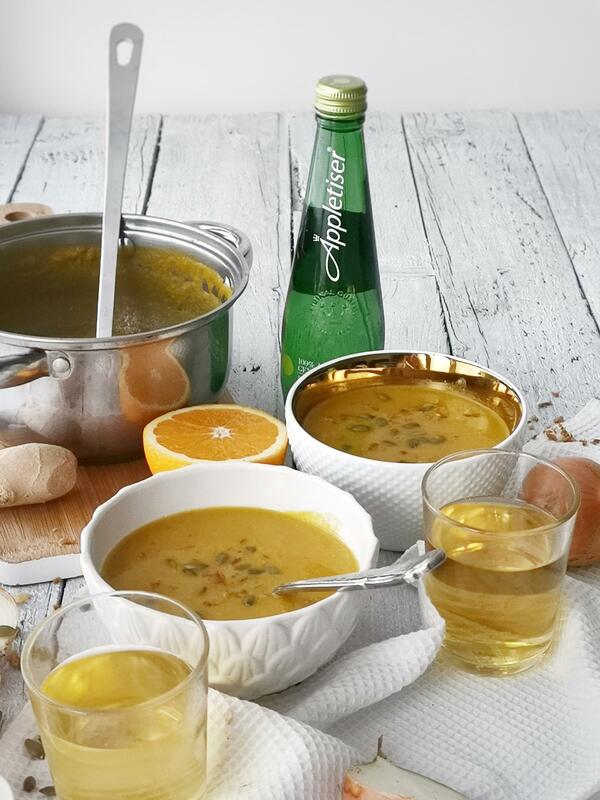 The combination of orange juice and curry has definitely left a mark in my memory, and I am therefore so excited to share this tasty recipe with you guys! Heating the fresh orange juice might break down some of the Vitamin C content, so I would recommend adding half the orange juice during the cooking process and adding the other half to the soup upon serving. 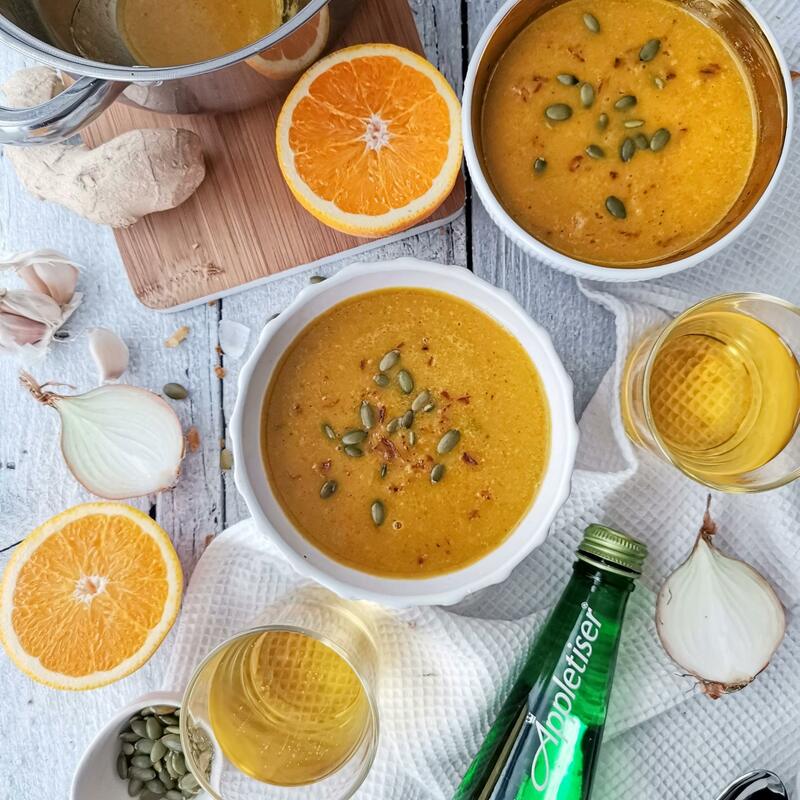 I love pairing this dish with a refreshing drink that also adds 1-of-your-5 a day, so a glass of fizzy-fresh Appletiser makes the perfect pairing for this fruity and more-ish soup. Would wouldn’t want to cross 2-of-your-5 off the list just with lunch?! 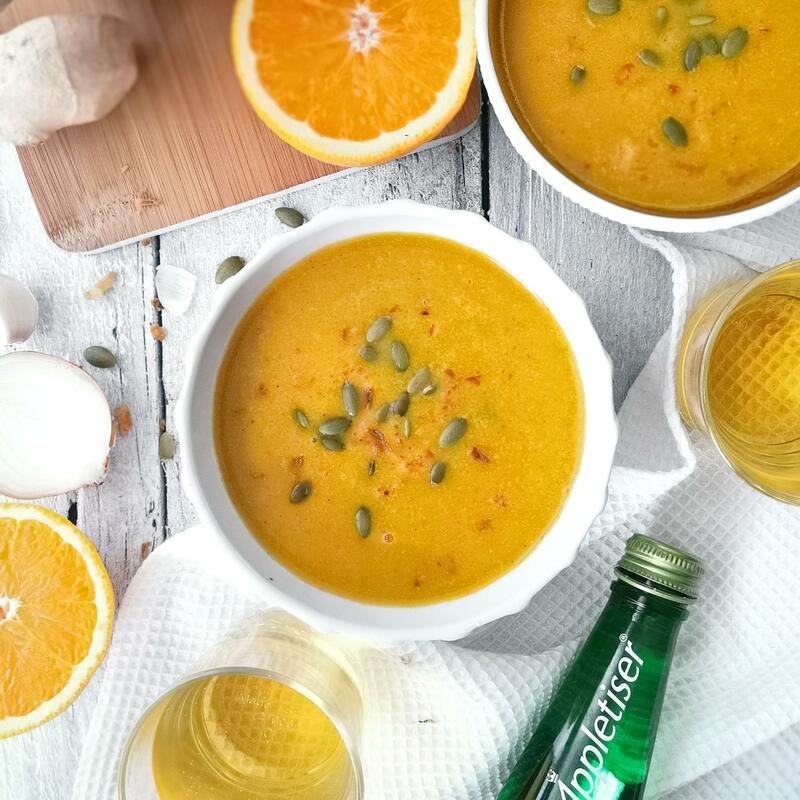 In comparison to the original dish I have also not added any sweeteners to this dish – the natural sweetness of the orange juice is more than enough to give this recipe a deliciously sweet & tangy flavour. No need for the extra sugar at all! Going through the ingredient list for the recipe, you might spot that I have used vegan white wine in this dish. If you prefer creating it without the wine, then simply replace it with a good dash of water. The heat whilst cooking however eliminates any alcohol in the wine, so it’s simply used for flavour enhancement in this dish. If you’re unsure if your wine is vegan, I would recommend checking Barnivore. 1. Add the Extra Virgin Olive Oil to a large saucepan alongside the diced onion and minced garlic cloves and cook until the onion becomes translucent & aromatic. 2. Add the cloves & carrot and cook for a further 1-2 minutes. Then deglaze the pan with the splash of white wine. If you’re creating this recipe without the white wine, simply use a good splash of water to deglaze. 3. Pour in the fresh orange juice and vegetable stock, then add a lid to the saucepan and let it simmer for about 10-15 minutes. 4. Mix in the coconut milk, then add the freshly minced ginger, garam masala and curry leaves and cook for a further 10-15 minutes. 5. Once the cooking time elapses, carefully remove the cloves and curry leaves. 6. Transfer the soup to a blender and blend on high-speed until smooth. Alternatively you can also use a stick blender. 7. 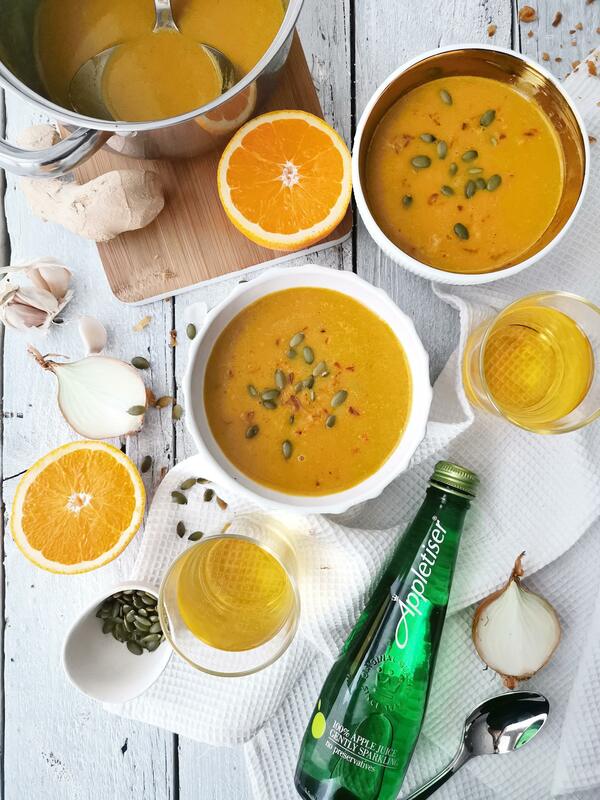 Serve and top with roasted onions and pumpkin seeds and enjoy with a glass of refreshing Appletiser!